Home → blog → Is the Yahoo! Weather app icon really that ugly? Is the Yahoo! Weather app icon really that ugly? Twitter is all a-buzz over the new Yahoo! weather app for iPhone. Does Yahoo! deserve this criticism over an icon? And we haven’t even heard a peep out of Marissa about branding yet (correct me if I missed that message/speech.) Her aim is to put Yahoo! in the hands of users on a daily basis. A useful and well designed collection of apps leveraging the latest tools and technology does just that. Rebranding Yahoo! does not get people to download apps; great, functional apps do. So, if Yahoo! is focused on tools, technology and mobile, and hasn’t made a play for a rebrand, then what were you expecting in an icon? Have you seen their lineup of icons for iPhone apps? Probably not since I bet the weather app was the first Yahoo! app you installed. The app icon fits the brand, the family of apps, as well as leverages design elements from the app itself. These icons are just as purple / bright / campy / colorful / in-your-face as the Yahoo! Weather one, if not more so. Some fit the app’s design; some don’t. The hard truth is that by installing this beautiful app Yahoo! is blatantly and publicly on your iPhone. It’s no longer hidden deep in the native iOS weather app. 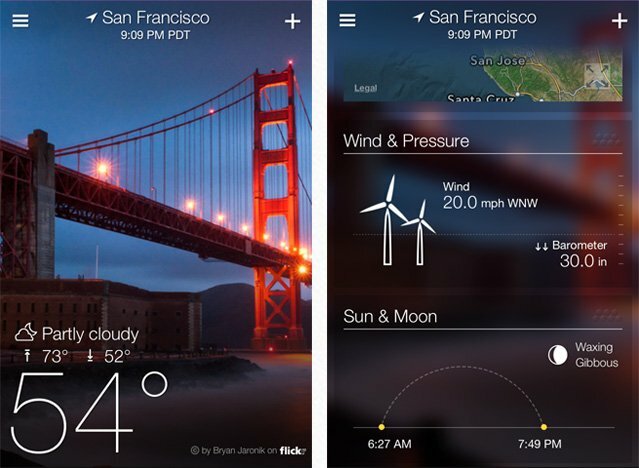 There’s now a beautiful and useful weather app installed on your phone, and it’s made by Yahoo! of all companies. Say it again: Yahoo! Your friends can see it while you try and drunk-text your ex, and you are not happy they might confuse it with Yahoo! Mail. You use GMail. You use HipChat or Jabber, not Yahoo! Messenger. And Flickr? You used to, but then fell off, and then you heard the app was great now and don’t know what to do. At least that flickr icon knew its place, right?! Admit it: Yahoo! has been perceived as Peewee league stuff in the world of apps, and now they show up to hit a homerun into the parking lot and the world has to cut them down somehow. It’s bully tactics, plain and simple. So, break out your phone and look at all the apps you have on there and tell me that you don’t have some of the most god-awful, overly designed icons installed. Then look at the Yahoo! Weather app icon and tell me it’s worse. I didn’t think so. You’re just pissed Yahoo! is on your iPhone.